Cowboys defensive end Greg Hardy will be making his 2015 debut Sunday against the Patriots, and he'll have the extreme displeasure of playing against supremely pissed off New England squad, led by quarterback Tom Brady. 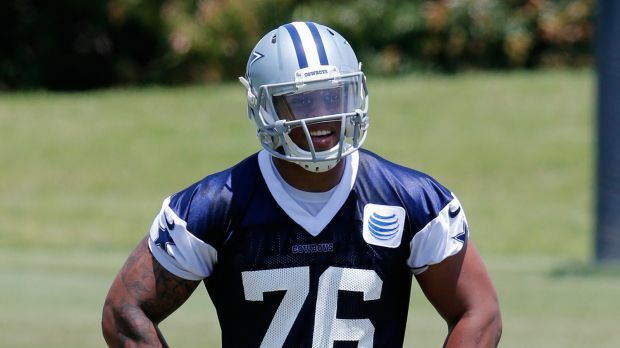 Greg Hardy: "I love seeing Tom Brady. You seen his wife? I hope she comes to the game. I hope her sister comes to the game..."
Sure, Greg, it seems you've learned a lot from your trials and tribulations after you beat your ex-girlfriend, THREW HER ONTO A BED OF LOADED ASSAULT RIFLES and threatened to kill her. As sure as you can bet the over on the total points scored for the Patriots on Sunday, you can bet that the offensive line will be sure to go out of their way to give an extra shot to Hardy when the bullets are flying in the trenches, never mind the F-Bombs Brady will be hurling Hardy's way as he's busy shredding the Cowboys defense.